Team USA cruised to another dominant win, picking up an 8-0 victory over Russia in the semifinals at the IIHF World Championship in Espoo, Finland, on Saturday, to advance to the gold medal game. Earlier on Sunday, host nation Finland stunned Canada, 4-2, to earn a spot in the championship game for the first time in Women’s Worlds history. For the United States, Hilary Knight (CWHL Les Canadiennes de Montreal) played in her 51st game at Women’s Worlds, setting a new record for American players. And she celebrated in style, posting five points (2-3-5) in Team USA’s victory. She scored the game’s first goal, one-timing a pass from Kelly Pannek to get the United States on the board 11:07 into the game. Knight then capped a five-goal second period for Team USA with a rocket from the top of the right circle. Pannek added two goals of her own to her assist on Knight’s first, while Megan Bozek (CWHL Markham Thunder) scored a pair as well, using her patented rocket of a slapshot. Annie Pankowski and Emily Pfalzer (NWHL Buffalo Beauts) each added goals, and Dani Cameranesi (NWHL Buffalo Beauts) had two assists. With Alex Rigsby’s (CWHL Calgary Inferno) shutout in net, Team USA has not surrendered a goal in over 278 minutes of play, outscoring its opponents, 30-0, over that span. Knight, captain Kendall Coyne Schofield (NWHL Minnesota Whitecaps) and defender Cayla Barnes were named Team USA’s three stars of the tournament. With her five points in the semifinal, Knight heads into the gold medal game with 11 points (7-4-11), leading all skaters in the tournament. Coyne Schofield held that title for much for the tournament, posting five goals and three assists. Young star Barnes had a breakout week on the USA blue line, helping the USA to its impressive shutout streak, as well as adding six points (2-4-6) on the scoresheet. The undefeated United States will have to get past a high-flying Finnish team that will have a boisterous home crowd on its side when the teams meet for gold on Sunday at 1 PM ET on NHL Network. 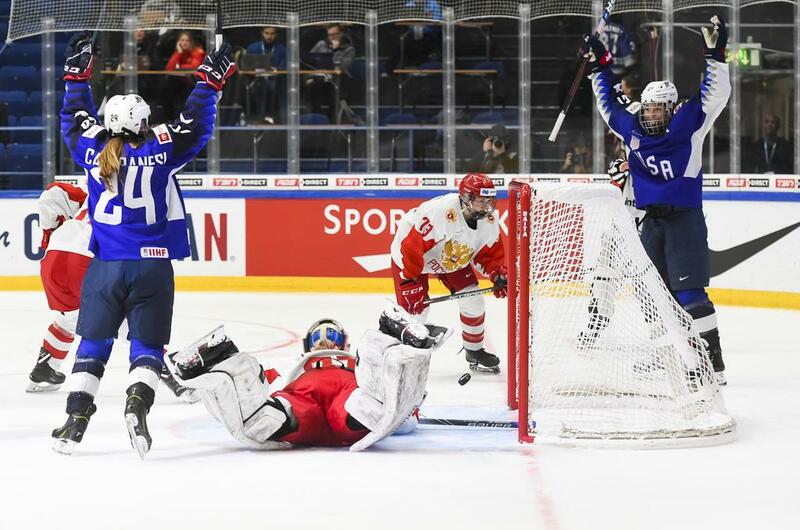 The Finns showed early in the tournament that they would be a threat to the traditional powerhouses, taking a 2-1 lead into the third period against the United States before Team USA scored five unanswered goals in the final frame to take the win. Sunday’s matchup will mark the first time in tournament history that there will not be an all-North American gold medal game. Canada will play for bronze for the first time at 9 AM ET, taking on Russia.